Showing results for tags '6n'. So I'm new to this site and new to cars. First car is 6n polo and it needs a bit of work on the body work. Most of it is pretty simple but I've found the blank on my passenger side rear is very broken and rusted ~ see photos. Not to sure how to fix it and wondered if anyone here could help. Thank you! for years i;ve been running the fuel pump on a 3amp fuse. never blown. 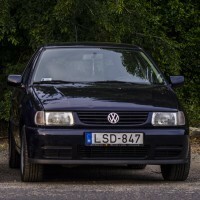 polo 6n. is it okay to carry on using the 3amp.? Quality front wheel bearings needed for 6N. I bought a cheap wheel bearing from a seller on EBay, for £13.95 . I fitted it into the hub this afternoon and it is nearly as noisy and has nearly as much play as the old, very knackered and very noisy one that I was replacing. Please could I have some advice on the best quality bearings to get for my 6N. I seem to get a noisy front bearing, usually once every year or so, so I'd like to get the absolute best quality possible, without paying through the nose. Suggestions gratefully received. I've managed to fit a mk1 Audi TT wheel in my Arosa and thought I'd share the photo's as the Arosa shares the 6N parts. I had to drill some holes, do a bit of filing and 3D print a bit. Just need to get an airbag to finish it. Much nicer feel. Hi, i have lowered my VW Polo 6n and seem to be getting positive camber in the front only on one side though... so basically instead of the wheel sitting out it’s pointing inwards! Very strange I think the previous owner has used washers on the rear... does anyone have a clue how I can resolve this? I don’t mind using washers if I have to! Just want to stop it driving odd and feel like I’m driving on my outer sidewall! Any helo would be grand! this black hose from the cannister must be made from some special kind of rubber ? it keeps dirtying the rag everytime I try to wipe it down. as if rubbers coming off it all time. is this how it's supposed to be or do I replace it. has the fuel vapours breaking it up? 6N AFH. Don't think these spacers were not on when removing the driveshafts unless the were disguised in grease. Part no 3 on diagram Are they even necessary? I'm renewing the bolts. 12 oem's for £20. Hey everyone, My name is Marcos and I'm from Madeira Island, Portugal. I currently own two cars, one of them is a VW Polo 6N 1.4 8v Open Air which was my first car, and the other is a VW Golf VII 2.0 TDI Highline which is right now my daily driver. I knew this forum for quite some time, back when I got some nasty problems with my Polo and tried to search for a solution on the internet and I discovered clubpolo.co.uk by accident. Now with all the mechanical problems fixed, I decided to retribute the help that I got and decided to take part in this active community and sharing my knowledge. Cheers ! After years of wanting one and a year of looking for one I've finally got one!! It's got high mileage, 165,000, but the engine runs nice and smooth. It's a bit tatty around the edges but it's probably the best condition polo I've bought yet - saying that's probably going to come back and bite me. Well we did a 2 hour drive to go and pick it up and me and my dad couldn't smile wide enough! There's a bit of rust on the arches, very minor, and minor rust on a few panels. When we got it home I went to open the door and the door handle came off - was no screw holding it in. The speakers don't work, simple wiring job. But the wheels are feking amazing condition! Don't even look like they've been refurbed just really clean! The plans for this year: *Fix door handle - probably do that tomorrow weather permitting *Fix speakers - tomorrow *Cambelt, oil change - general stuff when you buy a car. *Gradually get each panel sorted, can do panel by panel as colour match isn't vital as long as it's near enough. *But some 16v seats to steal the foam out of as the foam in the current seats has long gone - no tears though, well a tiny one. *Machine polish it. Only got one photo at the moment was to excited to take photos! Polished the wing and bumper and they came up nicely. The colours are really vibrant in person! Should be going to ultimate dubs next sunday in it. On a snowy day back in 2009 I managed to crash my wifes 6N into a raised bus stop curb, as you can imagine the results were impressive. Passenger side wheel at 45 degrees to the drivers and the steering wheel was upside down, we scrapped the car as a result. This wasn't a rash decision, lots of advisories on the previous MOT....oh and it was Cat C'ed a couple of years earlier when we were in a 4 car shunt in standing traffic. Boot lip pushed in 3 - 4 inches and front serverely deformed....we patched it up for £20 and kept driving! Car was brought for £1500 and we got £1100 payout, plus sold some parts....not bad for a car we had owned for 4 years at the time with 100k on the clock. So we ended up getting a sensible car, an 06 Honda Accord diesel...was the sport edition! And while we drove that around I picked up this.... And turned it into this...(Build thread here) At the start of the month I decided that the car had cost more than enough and that I should probably think about replacing my wifes Polo 6 years later.....especially since Mini parts are so expensive and you can still find a Polo at a scrap yard! In the 5 years I owned the car it had been driven 1500 miles and cost me half a years salary, which is a sobering thought as I am far from being on minimum wage. For the grand total of £200 I brought a 149k mile 1997 R reg 999cc Polo L Currently I am stripping down the car, seeing what work needs doing and parts i need to source So far it needs... Both rear arches repaired New rear valance underseal stripping off, rusty treating and reapplying Various rust patches repairing A full respray replacement carpets and retrimmed front seats Engine reconditioning (probably gearbox too) And probably a whole host of other things....but its a project. My plan is to keep the car pretty much standard, yes there will be a few modifications and fancys details added to the car along the way. I am a man I like shiny things and power, but at a glance i want it to appear standard. I will add photos and updates as I make progress.....which will be slow as I work away from home. I am giving myself a year to get it MOT'ed. I am trying to undo the dogbone mount bolt but it is not budging. 16 spanner on both and I am turning the nut anti clockwise? Is this right direction, because I feel if I try any hard I am going to round the bolt. 6N engine bay carpet/sound insulation? In the engine bay back wall there is a carpet material. Is this just for sound proofing or something more? Can I strip it out? when you running bike cards with an after market ecu what wiring can you get rid of to clean up the engine bay. is the original ecu made completely redundant as im sure the rev counter still works from there. is the knock sensor wiring now redundant. what about the wiring thet comes from the geabox? Been gone since 2012- back in a Polo! After owning a breadvan very briefly in 2012 I’m back in a Polo- this time a 6n2 as a daily. Also own a 2015 Audi S3 but the Polo will be my run around/daily car. It’s on coilovers (not looked to see what ones yet) and wolf race alloys too. So far I need a drivers side manual (wind up) window regulator and new mechanism to open to drivers door from the inside. No massive dramas and I’m very happy with it so far. Hello everybody. This is my Polo 6N 1.6 8V Proud owner from 2002...last October i resprayed it in the factory Dragon Green colour.